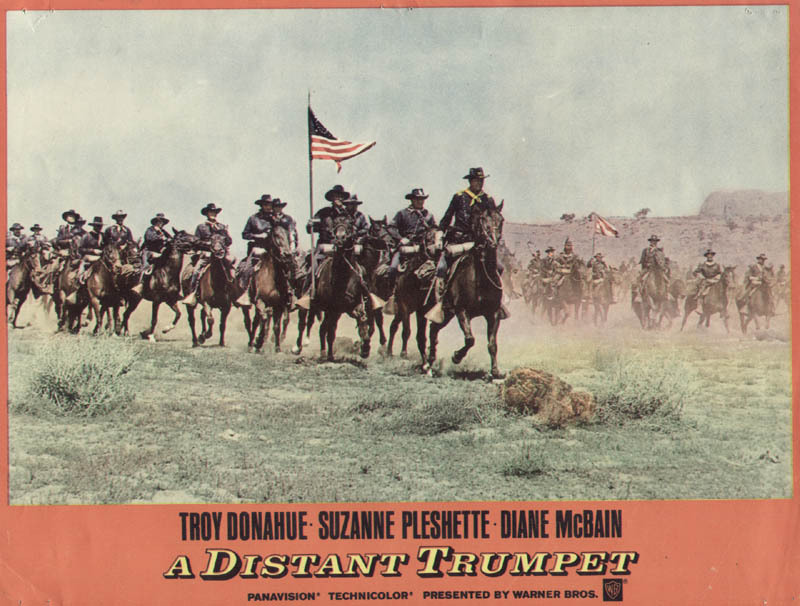 A DISTANT TRUMPET starts off literally on the right notes, with a smashing Max Steiner main theme, the last and best of his many great march compositions, blasting across the screen with trumpets howling and drums pounding. Shortly thereafter, and for most of its 117 minutes, this 1964 cavalry epic honks wincing flats. Paul Horgan’s 1960 novel was a 630-page bestseller, considered a classic of western fiction. 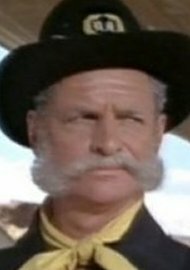 Cavalry Movies as a sub-genre of westerns were really an offshoot of the military experience from WW2, using the previous century’s settings as a vehicle for grafting war stories into the nation-building narrative of frontier sagas, basically a one-two punch for ticket sales. Warners assigned legendary action master Raoul Walsh a plush budget of $2,700,000, blessed the production with William Clothier (The Alamo, Cheyenne Autumn) behind the camera, and sent them to outstanding desert locations in Arizona and New Mexico (notably Red Rock State Park) where hundreds of Navajo extras, stuntmen and horses swarmed the action. The 77-year old Walsh had fifty years in the business, starting in spectacular fashion in 1914, assisting D.W.Griffith in Mexico, filming Pancho Villa during actual battles of the Mexican Revolution. He piloted Cagney, Flynn and Bogart through bona fide classics—The Roaring Twenties, High Sierra, They Died With Their Boots On, Objective Burma, White Heat to name a few, gave John Wayne his first lead (The Big Trail ): in other words, he was as vet as a vet can get. But his powers were on the wane, and he was ready for a swan song. Unfortunately he was saddled with as standard and clichéd a script as John Twist (aptly christened) could mangle from Horgan’s detailed opus: the plot, incidents and dialogue come out like anesthesia. 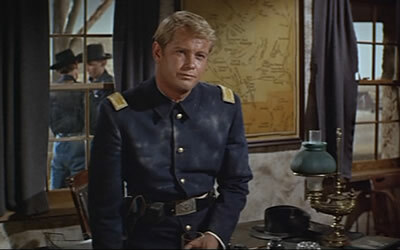 The big blond burr in the saddle was leading man Troy Donahue, who the studio was still trying in vain to foist off as something like an actor instead of a movie magazine mug—he’s..um… terrible. Clothier didn’t stint his opinion: “the stupidest sonofabitch I ever met“. Wow—at any rate, he’s not remotely convincing when it comes to riding, fighting or…talking. Somehow he briefly charmed sultry co-star Suzanne Pleshette, as they married after filming (wedded bliss lasted eight months). She’s wrong in the movie, too, as is Diane McBain: their hairstyles and attitudes are only off by eighty years. James Gregory and Claude Akins toss a few amusing sparks, hamming like mad. The costuming of the soldiers is well done, believably dust-caked, but the full-dress war bonnet regalia that outfits the ‘Apaches’ (Navajos) is straight from an inept technical advisor. The warriors sport togs that belong to tribes a thousand miles away. Two thirds of the way through, Walsh stages a big-time battle, which is quite impressive in its size, energy and choreography, but it’s also fairly jaw-dropping in the casually gleeful mowdown of Indians. There’s a great “bite-this” moment available in a documentary about the treatment of Native Americans in the movies, which features accurate subtitles of the words spoken to Donahue by one of the ‘chiefs’ here–it ain’t in the script. Color is superb, sound is good, old geezer action fans who can live with incorrect p.c. will enjoy Steiner’s music. Like Walsh, Steiner had been around since California was born, and was considered the ‘Father of Movie Music’–his scores too numerous to list. To show how out of touch whippersnapper studio exec punks were when this was made, one of them had the temerity to ask Steiner if he’d “ever scored a western?” People that stupid run studios, just like they run the country. With Judson Pratt, Larry Ward (the ants get him—‘neat’ in that grisly way boys appreciate, proof to girls that they will never fully understand us), William Reynolds, Kent Smith, Russell Johnson and Bobby Bare (country crooner famous for “500 Miles”, a #10 charter in ’63—thank me for this trivia later).